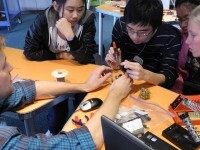 The table­top Makerspace was a Mitacs intern­ship project con­ducted in col­lab­o­ra­tion with Science World. A set of class­room tools was devel­oped to sup­port ‘Maker’ activ­i­ties at the museum. The tools included a home-built 3D printer and a set of elec­tron­ics kits for work­ing with the Arduino micro­con­troller. An intro­duc­tion to elec­tron­ics work­shop was devel­oped with local makers and Science World staff, which con­tin­ues to run at the museum and in the com­mu­nity.